"What secrets do you expect us to have, Eva?" 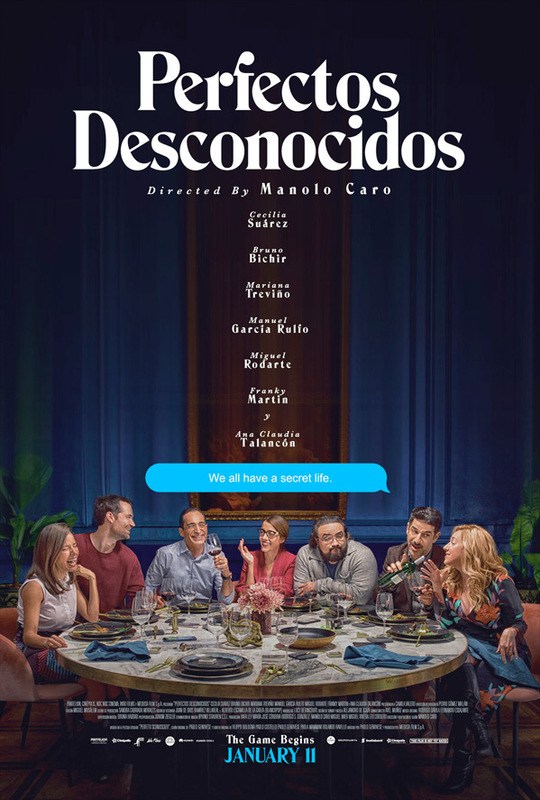 Pantelion Films has unveiled an official US trailer for the release of Perfectos Desconocidos from Mexico, remade by filmmaker Manolo Caro. The title translates to Perfect Strangers, and they're billing this as a "Spanish speaking comedy with English subtitles" from Mexico. It's actually the second remake of an Italian film which first premiered in 2016 - Perfect Strangers or Perfetti Sconosciuti, which was then remade in Spain last year, and is now being remade by Mexico. This version of the film stars Cecilia Suárez, Manuel García-Rulfo, Mariana Treviño, Miguel Rodarte, Bruno Bichir, Ana Claudia Talancón, and Spanish newcomer Franky Martin. This actually looks like a super fun cinematic party game, with a dash of commentary on how much phones have changed our lives. We all have a secret life. How many secrets would you dare to share? This Spanish speaking comedy with English subtitles is from Mexican auteur Manolo Caro about a seemingly simple dinner until the hostess proposes a provocative party game. The game quickly becomes a wild ride full of twists and "textual tension" in this electrifying over the top film. Perfectos Desconocidos, translated to Perfect Strangers, is both written and directed by Mexican filmmaker Manolo Caro, director of the films I Don't Know Whether to Slit My Wrists or Leave Them Long, Love of My Loves, Elvira I Will Give You My Life But I'm Using It, and Tales Of An Immoral Couple previously. It's based on the original Italian film from 2016 also titled Perfect Strangers, made by Filippo Bologna & Paolo Costella. Pantelion Films will release Caro's Perfectos Desconocidos in select theaters starting on January 11th, 2019 at the beginning of next year. Interested?